One of the articles talked about framing scientific information to make it relevant to different audiences, and for some odd reason I thought of my dad and Yahtzee. My dad is crazy brilliant. It's ridiculous how smart this man is. Yet every time I came home from break in college I'd have to re-explain DNA, starting from the beginning. A lot of people have this mental block with anything scientific or mathematic. But if we frame it in a way that is relevant, maybe we can convey complex (or even simple) scientific ideas in a way that will resonate and stick with the audience. Framing organizes central ideas; pares down complex issues by giving some aspects greater emphasis. My paternal grandma played the Penny Game with us bazillion grandchildren growing up to help teach us simple math (and it was a good game to play with a lot of people, and there were a lot of us around).2 And growing up (and even now) my family played a ton of Yahtzee, which is (for those not in the know) a dice game that requires you to roll five dice each turn and check off various combinations (three of a kind, a straight, etc).3 Perhaps I could use Yahtzee to teach Dad, a master Yahtzee player, simple statistical concepts. Take probability, for example. Anyone who has taken a stats class had heard the line, "Probability has no memory." This is key - probability is how probable or how likely an event is. To calculate probability, you divide the number of ways an event can occur by the total number of possible outcomes. Since I'm talking about Yahtzee, let's go with dice as an example. A single 6-sided die has, obviously, six sides. So, the probability of rolling a 1 on this 6-sided die is 1 (you can only roll the 1 once) divided by 6 (six total possible sides) = 1/6, or 0.167. Yet this is not additive - if I roll a 1 (my 1 in 6 chance), on the next roll probability starts all over again with a 1 in 6 chance. The probability that I roll a Yahtzee - all five dice are the same number, e.g. 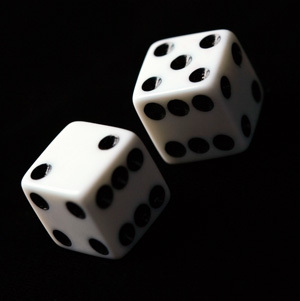 all five dice rolled come up as a 1 - in any particular game is about 1 in 22, or a 4.6% chance, although the real probability is likely slightly less. This is why Yahtzees are scored as 50 points, because they're more difficult to roll.4 But what if I want to pull a Babe Ruth and call my Yahtzee beforehand? Say I roll five dice and I announce that my plan is to get a Yahtzee in ones.5 For any one die to come up as a 1, there is a 6^1 possibility of getting a one - 6 possible outcomes, 1 outcome I want (6x1 = 6, or a 1 in 6 chance). For any two dice to come up both as 1, there are 6^2 possibilities (6x6 = 36). And so on, up to 6^5 (=7776, or a 1 in 7776 chance). So, the probability of rolling a Yahtzee with ones on my first roll is 1 in 7776. Not good. Anyway, say by some statistical anomaly that I roll four dice that come up as 1 (a 1 in 1296 chance - 6^4, or 6x6x6x6=1296). What is the probability that the fifth die comes up as a 1? Surely fate has a hand in my game, and I'm more likely to roll a 1 since my other four dice are all 1, right? Nope. It's still back to that original 1 in 6 chance. Probability doesn't give a damn that if I score a Yahtzee I can beat my siblings and earn bragging rights until the next game. Anyway, this small example shows that no matter what you roll, the dice you have on the table won't influence the dice in your hand - probability has no memory of what it just rolled. So, the probability of getting my average 249.55 score (let's just round up to 250, shall we? I had a baaaaad run of games there) is slightly higher than 45%. This of course is just something I plucked out of the air, but it shows how you can take something with which a person is familiar - a game of Yahtzee - and use it to illustrate scientific concepts. As I said above, framing pares down complex issues by giving some aspects greater emphasis. In this case, I used Yahtzee to illustrate probability and mean. A comprehensive stats lesson? Not by any stretch. But if I want my listener/reader to understand probability, I don't need to give the full history of the development of statistics, and it's a lot easier to use familiar examples so the reader/listener can imagine the concept. 1 Seriously, it's good stuff, both for aspiring writers who have yet to pick up the pen (or keyboard) and those of us who have been doing it a long time. 2 It was also a good way for us grandkids to earn some money, as we were allowed to keep our winnings. Given that we played with pennies it was a pittance but to a kid a dollar is a LOT of money! Thus Grandma instilled in us a love of gambling and swearing in German. 3 The best part of the game was when anyone got a Yahtzee - all five dice were the same number - we would all throw up our arms and yell at the top of our lungs, "YAHTZEEEEEEEEEE!" and pound our fists on the table like drums. That was awesome. Not gonna lie, I still do it. 4 My aunt Margie always said that in Yahtzee, fours are hard to come by. Statistically this is inaccurate. But it's a good catch-phrase. 5 If you really did this in Yahtzee, you'd be hit with incredulous glances on all sides, as well as "WTF are you doing?" exclamations. And for good reason. This is an asinine move. 6 The average score in a game of Yahtzee is about 250, assuming you don't get a Yahtzee. 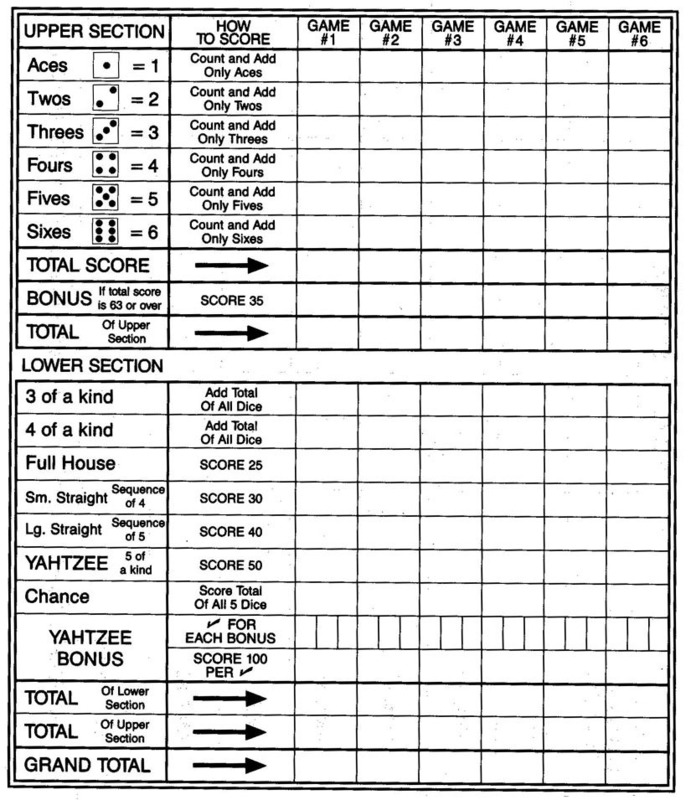 If you get a Yahtzee, the average score is anywhere from 270-320, depending on whether you get the top bonus. Note that this is simply a calculation from the games on my phone - I have scored higher than 522 in my life, and sadly lower than 126.